The Bio: The child of God, the husband, father, musician, and songwriter. Dave is the son of Dave & Rosemary Byers and brother of Amy. He grew up in Wellsville Ohio. He played guitar in several bands performing in clubs throughout the area and teaching lessons. After school he did some carpentry work and then after a few years went into the Air Force for 4 years traveling from Texas to Colorado, Alaska to Kansas. "I went to church as a child but never had a relationship with God other than just knowing He was there" Dave says. I had my time of running wild and so on but thank God several people continued to come into my life and steer me towards God. I thank my mother and father greatly for their love and examples they gave. I also thank God for a few friends parents along the way steering me towards a relationship with God and away from some of the music I was interested in. If you listen to the lyrics of songs your often amazed what they're saying to you. Then my now father in law gave me the opportunity to ask God into my life and I accepted. Many years have passed and I have served as a guitarist, worship leader, deacon and board member at several churches as our family has moved around over time. God is first and rightfully so. I know without a doubt God is real and I can say that from experiences in my life. I have no idea how people make it through life without him especially when the evidence is so clear to me. I thank Him every day for His grace and mercy as well as His blessings and love. Dave was fortunate enough to meet Christine and certainly blessed to marry her in 1988. They have celebrated over 30 years of marriage now Dave says he got the better deal without a doubt. "Marriage is a work in progress. No completion as you have to get up every day and do your best again. I very much appreciate my wife and know that she has made a big impact on me and she does so much for me and our family." Dave says "the 1st moment I laid eyes on my daughter changed my life. She was our first and the experience of being a father has changed my life and I love it. There is a lot of responsibility but the joy that comes from watching your children grow up is immeasurable." Dave and his wife are the proud parents of Amanda, Zach and David. Son in law Anthony, daughter in law Tricia, daughter in law Haley, and grandchildren Zoey, Anthony, Morgan, and Zach Jr.
1979 Dave's mother and father bought him his first guitar. Many thanks to mom for taking him too lessons soon after and his family for supporting his love of music. Dave quickly began writing songs. He played in many bands throughout the early years and played on stages and clubs throughout the area. After committing his life to God he has played in several worship teams as the guitarist or worship leader. He has often done specials for various churches, fairs and festivals as a solo musician and also with his band the 3:16 band. He has released many cassettes and CD's over the years always independently produced and some of those are featured here on the music page. Dave founded the website christiansongwriting.org which has helped connect and educate songwriters from all over the world. His book "The Songwriting Fundamentals" has been sold worldwide. Dave served in the US Air Force 1984-88 and over the years sold major appliances and electronics as well as furniture. Currently Dave owns DC Music Store in Ohio. In 1998 he founded the online site proaudiomusic.com After a few years of selling online Dave decided to open the storefront also. That was opened in 2002 in Calcutta AKA East Liverpool Ohio. When he decided to open the store he thought to change the name from Pro Audio Music to DC Music Store because it seemed a better name. His wife Chris has helped immensely in this from the beginning and his children Amanda, Zach and David also have worked at the store over the years. The store does a lot of online business from all over the world and ships items daily through it's busy online store of dcmusicstore.com with the guaranteed lowest prices and of course with a very friendly and knowledgeable sales staff. Dave is assisted by a great sales staff as well as terrific instructors at the store. Dave combined his love of music with his day job and has owned DC Music Store since 1998. He now talks about and plays music 24/7. Around 2015 his son Zach (pictured below) joined him in business where they formed an LLC Corporation Byers Enterprises which they use to operate their business. 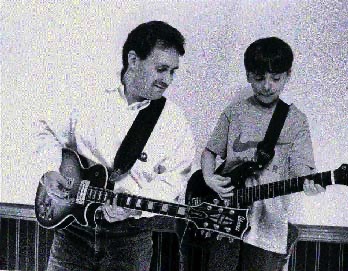 Dave jamming with his son Zach many years ago.